My name is New Jersey Nick, and I’ve been scouring the Garden State looking for all the best Good Food That’s Bad For You; Burgers, Fries, Dogs, Burritos, and anything else that you need to jog off the next day. No fancy places for me. Just burger joints, diners and haunts favored by adventurous eaters and carnivores alike. I find the best places, and I hope you go give them a shot. 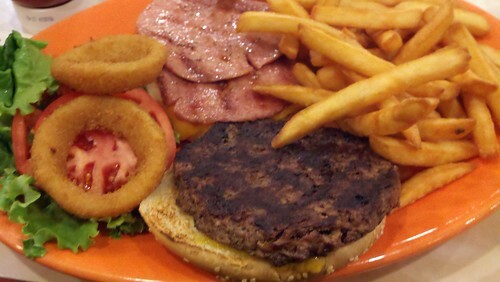 This week, I check out the burgers at the Time to Eat Diner in Somerville. The Place – I love a good diner. It might be my favorite piece of Americana. I love the breakfast, the greasy appetizers, the milkshakes, and, of course, the burgers. I also love when there are a variety of burgers on the menu. The Time to Eat Diner in Somerville has over 20 burgers on the menu, so you know I had to write about this piece of the New Jersey Foodscape. 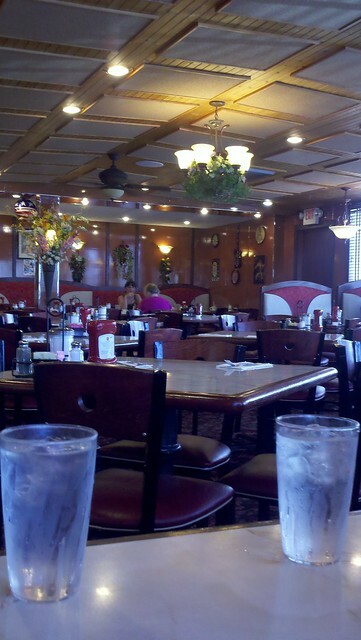 The Diner itself is fairly large, with two dining rooms and seating for 200. You may want to bring your jacket. No not the fancy kind, just something warm. The sign on the door says “We use air conditioning. Dress appropriately.” That’s a nice way of saying “deal with it.” I happen to appreciate the attitude, because I always appreciate a nice cool place. The Menu – So what’re you gonna eat here? Making that choice is going to be tough, because the menu is loaded. In addition to the standard breakfast and diner faire, a whole page of specialty salads, a whole list of soups that changes daily, a selection of paninis, and a smattering of greek and italian entrees. 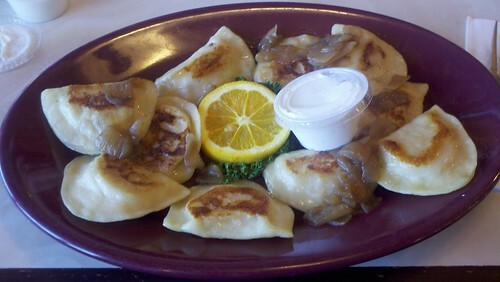 Appetizers – Don’t bother reading the appetizer page, just get the Pierogies. They are the most delicious selection. The pierogies are fried and only slightly soggy. I’ve ordered them on multiple visits, and excellent every time. And, they serve so many as an appetizer you could consider getting this for your meal. The Burgers – Time to Eat has a HUGE burger menu. It took a couple of trips, but I got to try quite a few. 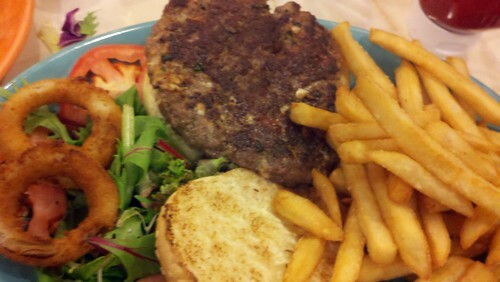 What makes the Angus Gorgonzola Burger special are the chunks of gorgonzola, basil and garlic in the patty. Even when ordered medium rare, the patty itself was still a little dry. It had a very, very heavy presence of garlic, so if you’re into Garlic, you’ve found your burger. 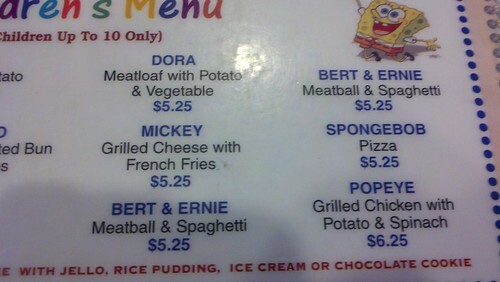 The Teriyaki Burger looked like an interesting choice. 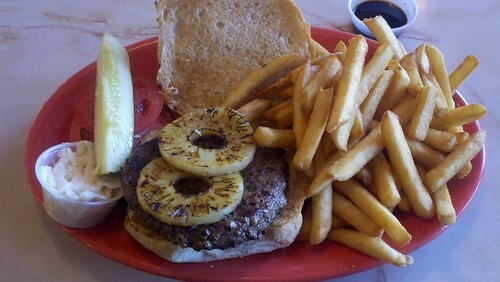 It comes with teriyaki sauce and is topped with grilled pineapple. The patty is not MARINATED in Teriyaki as the menu states, and you instead get a cup of it on the side. Nontheless, the tanginess of the teriyaki mixes well with the sweetness of pineapple. I was just disappointed because I was looking forward to a marinated patty. 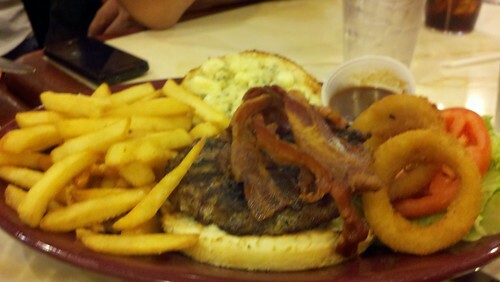 The Blue burger with blue cheese and steak sauce, is a tasty burger and not too cheesy. The bleu cheese is not as overpowering as you might imagine and the steak sauce does its part to help pull it back. The taylor ham and cheddar Jersey Burger is a good reliable Jersey burger. Luckily it tastes just like you’d expect, which is why you should it. 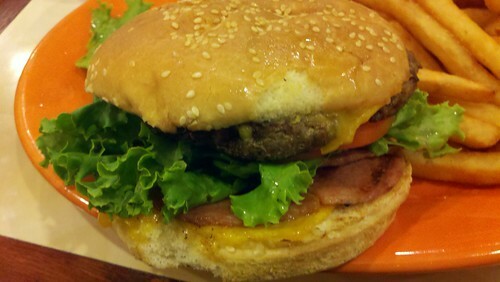 I really enjoyed this burger, and it was probably my favorite one of the lot. 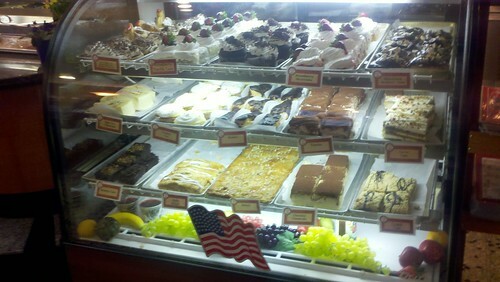 The Dessert – The waiter knew the dessert menu off the top of his head and went through it so fast I missed most of it. I can’t remember it all, but I definitely heard chocolate pudding, vanilla pudding, rice pudding, blueberry pie, apple pie, cherry pie, cheesecake, brownies, strawberry shortcake, rice crispie square…Whoa. I really felt like I was under a lot of pressure when I had to pick one. 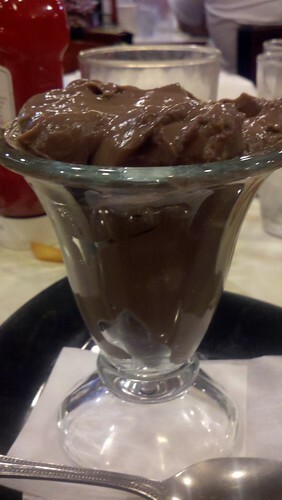 I went with the safe bet of chocolate pudding, and they served it to me in this bowl vase. It was like there was a whole box of Jello in there. 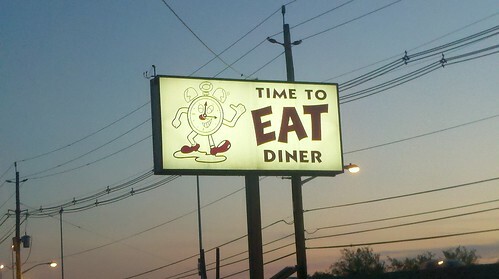 The Time to Eat Diner was a good roadside find, and I’m glad I stopped there. Lots of tasty menu choices always keep me happy, and I love a long and creative burger menu. It makes each visit an adventure as you try the next unique burger. Even if you don’t want a burger, there’s tons of stuff to choose from. All in all, a cool diner and I hope you give this month’s diner pick a shot. As New Jerseyans, we need to support our local diners not just as local businesses and eateries, but as part of our culture that helps keep our home unique. Keep eating and email me at [email protected] if you find a worthy New Jersey burger out there. New Jersey Nick – If the Jersey Devil was 6’1″, overweight and bearded, his name would be Nick. New Jersey Nick can not cook without the aid of a microwave, but, thanks to an iron stomach, he has learned about food by being a fearless and adventurous eater. A self-proclaimed Burger Expert, Nick forgoes fancy restaurants to get a taste of all the ‘good food that’s bad for you’ from New Jersey’s Diners and Burger Joints. When he’s not writing about food, Nick spends time on his other hobbies as an Xbox enthusiast, a Horror Movie Savant, a Nascar follower, a Comic Book Reader and a Pro-wrestling fan. Just like Batman, Nick has a day job in the real world that isn’t as interesting as his alter ego. You can read more about Nick’s adventures on his site at www.newjerseynick.com, follow@newjerseynick on Twitter or ‘like’ him on Facebook.